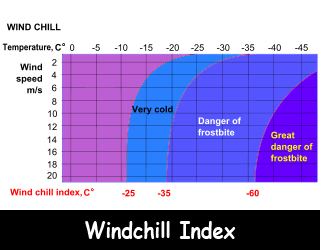 Wind Chill can be defined as the cooling effect of the wind and temperature combined. This windless, low temperature is also known as wind chill factor. It is a measure of the heat loss rate from the skin which is exposed to the air. In other words, it is the decrease in air temperature felt when the wind touches our body. It is a mathematically derived number that approximates how cold your skin feels. When the wind blows across the exposed surface of our skin, it draws heat away from our bodies. This is the reason why it makes us feel cold. The windchill factor is the same effect that causes you to blow on hot soup to cool it down. This way the soup cools down faster because movement of the air increases the soup’s heat loss. Atmospheric air provides an invisible layer around the skin under windless conditions. Wind Chill does not reflect the increased rate of heat loss for inanimate objects such as automobile radiators under the same conditions. A windchill warning is issued when the forecasted wind chill temperature is -25°F or lower. This condition can be life threatening if you are not suitably dressed. Being exposed to extreme cold temperatures for a long period can cause frostbite or hypothermia. Our skin temperature cannot drop below the actual air temperature. There are different windchill indexes and all of them use different formulas. American explorer and geographer Paul Siple and his fellow explorer Charles Passel came up with the idea of calculating wind chill. Declan, Tobin. " All Facts for Kids about Wind Chill ." Easy Science for Kids, Apr 2019. Web. 18 Apr 2019. < https://easyscienceforkids.com/wind-chill/ >.